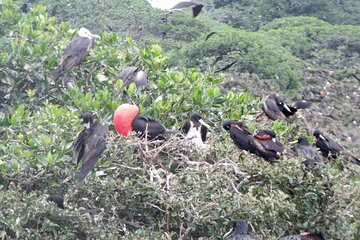 Na Isla de los Pajaros, você não precisa voar até as Galápagos para aproveitar a diversa avifauna do Equador. Esta viagem de um dia de Guayaquil leva você de Puerto Morro através das florestas de mangue da costa até uma ilha onde numerosas espécies de aves migratórias fazem sua casa. Encontre fragatas, albatrozes, garças cor-de-rosa, biguás e peitos em seus ambientes naturais. The 25 minute walk along the trails of the island of birds never took place. The most interesting spa beaches places were never shown. The beautiful view of the Virgin of the Rocks was never mentioned. We did not stop to seethe church of San Jacinto. We did stop by the old bakery where for over 100 yearsdevoted to the development of bread. We did see the dolphins and birds. To reach Puerto Moro took two hours and fifteen minutes.